Energy Consumers Australia is consulting on options to make it easier for consumers to access, use and benefit from their electricity meter data. 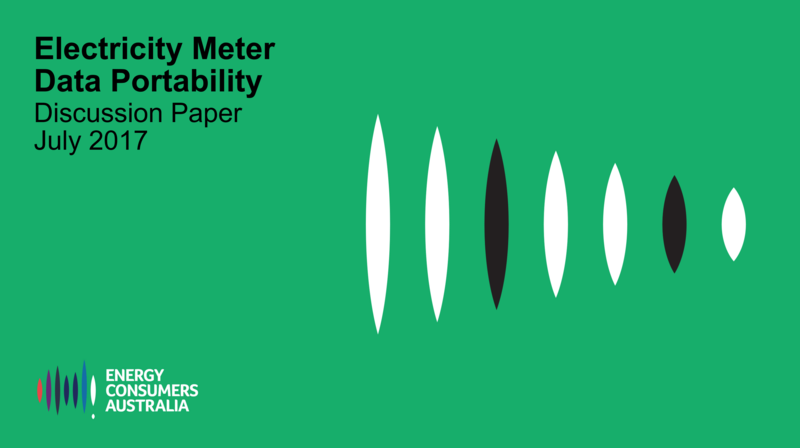 This discussion paper provides an overview of the current arrangements that govern the use of meter data, explores drivers and opportunities for reform and outlines an industry-led process to deliver ‘data portability’. With the AEMC-Climate Change Authority, the Finkel Panel and the Productivity Commission all making significant recommendations around consumer data in recent months, Energy Consumers Australia wants to work with stakeholders about how we can leverage data to deliver better outcomes for consumers. Better use of meter data can help consumers compare products and services, and maximize the value of their investment in rooftop solar PV, batteries and other technology. The benefits also flow to other market participants, especially networks. Tools to analyse pricing will facilitate consumer take-up of cost reflective prices. Optimised distributed energy resources (DER) responding to cost structures will contribute to peak demand reduction. We would welcome feedback from all stakeholders on the discussion paper – whether that is via the comment field below or by telephone or email to David Havyatt.